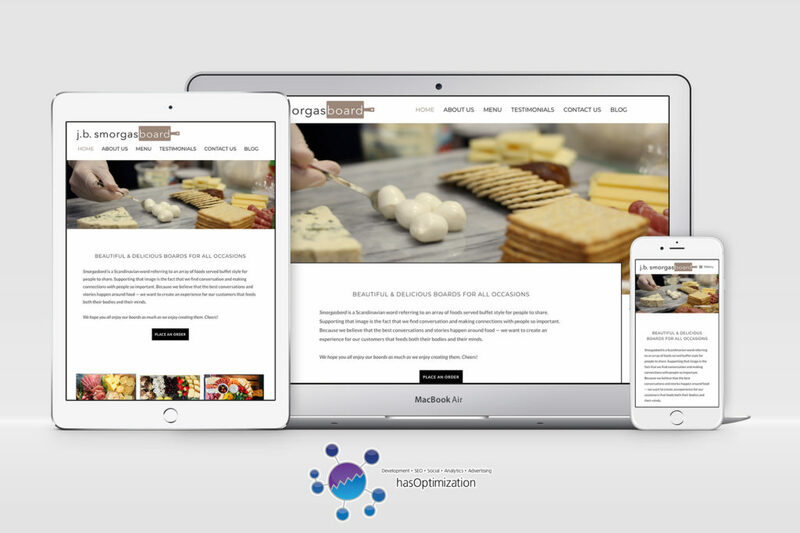 hasOptimization is proud to announce the launch of a new website for NH appetizer platter catering board creators j.b. smorgasboard! We worked with owners Jill and Brit to launch their first ever website, logo, and marketing materials. We were happy to be able to assist these new business owners with taking their first steps forward into becoming full time business owners. The j.b. smorgasboard duo had a lot we needed to get settled. Since this was their first ever attempt to start getting out onto the web, we helped them with their overall branding package and getting them started on social. We had our ever amazing partner associate create the pair a fantastic logo based on their desire for a “scandinavian” look and feel – minimalist, clean, and definitely a lot of white. We then helped them claim their domain – as well as any common misspellings that might occur, such as “jbsmorgasbord.com” since they were playing on the word “smorgasbord” with “smorgasboard”. We also assisted in directing the creation of social accounts, got them up and running with a much-needed Gsuite account, and prepared their website. All in all, we were glad to help these new business owners to launch their business in a more official manner. We were also quite happy to see all those delicious pictures of their boards come through. Best of luck to the crew at j.b. smorgasboard! We’re rooting for you! Check out the new j.b. smorgasboard website! ⟵GoDaddy: Possibly the Worst Web Hosting Company Available?